Colouring apps for adults seem to be increasingly popular. I decided to have a look around and see whether I’d have fun with one. Most of the apps that I looked at offer a free version with in app purchases required to unlock additional facilities. Some such as Pigment and Colorfy are subscription-based. But I thought £3 a week forever for something I wanted as an occasional diversion and not an obsession was over the top. I decided to go with Adult Colouring. The name is unfortunate as it suggests something naughty, which, of course, is not the case. I installed Adult Colouring on my 12″ iPad Pro and worked with the Apple Pencil. I played around with the free version and decided that the price to unlock the full version was fair. The app opens with the Books section. Each book is themed—Pixels, Geometric, Celtic, Flora, Mandala and so on. There are about 18 altogether, but more are added periodically, and there’s a new design added daily. Each book contains several designs for you to colour in; for instance, my favourite, Geometric has 24. The free version of the app only has a limited subset. Plenty enough for you to play around and determine whether you want to pay the £4.49 to unlock everything. Similarly, the free version has only a limited number of colours. Unlocking the full version gives you access to 221. You can unlock individual books and palettes at less than £4.49, but it’s hardly worth it as one book costs £2.29 and one palette is £1.49. Adult Colouring offers only one option for colouring: fill. To start, touch a book and then choose a design from within that book. Pick a colour and touch on the design to fill an area with the selected colour. You can use pinch and zoom to get at the smaller areas of a design. Repeat until your piece of art is complete. Two useful features for “colour management” are the Recent Colours palette that updates each time you add a new colour to your design, and the colour picker: if you do a long press on a colour in your design, the app sets that as the current colour. I didn’t see these features in some of the other apps that I tried out when it became trial and error to find the same colour. It would be handy to have the ability to create custom palettes from existing colours and add new colours using some form of colour mixer. I emailed the developer with these suggestions. If you make a mistake, there is an undo feature that takes you back one move. I think you can go back as far as you wish, but there is a clear option on the More menu if you really do want to start from scratch. As you create new designs, both the complete and incomplete ones are saved under My Art. The app can play a variety of restful soundtracks to sooth your creative breast. See the list in the next slideshow. I usually work with sounds off, but they may appeal to some of you. A background texture can be applied to your design: brick, plaster, watercolour and more. The full list can be seen in the last slide show. These next slides show how all the textures look. The More menu has options that allow you to save your masterpieces to the camera roll and share them with the world using the usual social media—Instagram, Facebook and Twitter—plus email. You can add your name to the output and choose a picture frame. 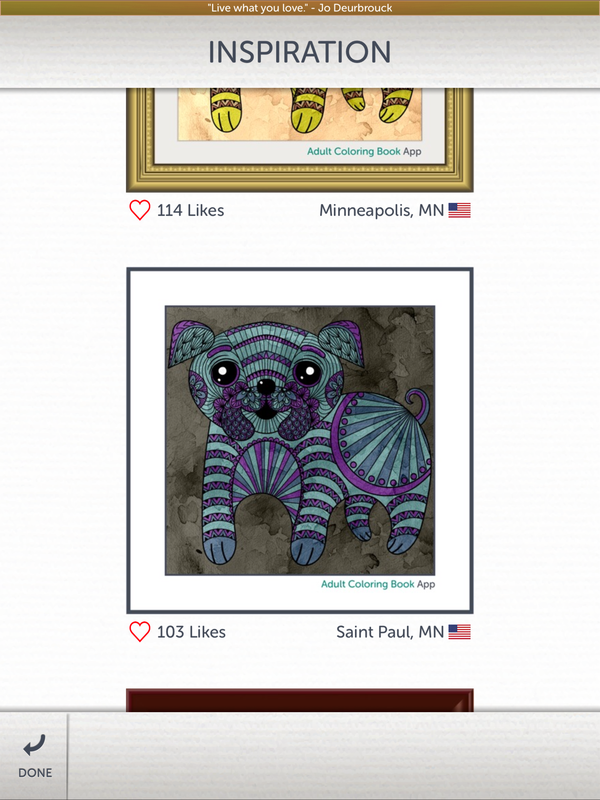 The app, unfortunately, insists on sticking “Adult Colouring App” on the bottom right of the framed design. I couldn’t find a way to disable this inside the app, but it’s just a few moments work in Pixelmator to remove it; the “no texture” example in the previous slides had been so treated. There is help, but it’s fairly simple because the app doesn’t need much explanation. The other option on this menu is Animate. This creates a 256×256 GIF of the design showing how it was created one colour splat at a time. I have put an example GIF on the last page of this article because it quickly becomes annoying. The app has worked faultlessly since I started playing with it a few days ago. Judging by the version history on iTunes, the developer is working hard to make improvements. I have already mentioned some tweaks I’d like to see with the colour palettes. Other possibilities are an option to change the colour of the lines, have textures in the fill colour and improved title/caption capabilities, output of design without a frame. All in all, I have found Adult Colouring good fun and for what I want—something that’s easy to pick up and spend some idle time pretending to be creative—good value for money. I couldn’t see I’d get much benefit from taking out a £2.99/week subscription. There are so many blank designs, there’s sure to be something that appeals to you. As I said, my favourite theme is geometrics. There are myriad possibilities with even a set of circles. Here are some examples of my work, which should give you more idea of what this app can do.